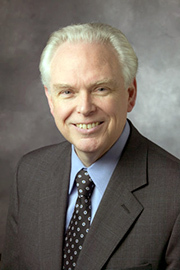 A study by neuroscientist William C. Mobley, MD, PhD, chair of the Department of Neurosciences at the University of California, San Diego School of Medicine, and colleagues at Stanford University Medical School has demonstrated a possible new approach to slowing the inevitable progression of cognitive decline found in Down syndrome. The study, published in Science Translational Medicine on November 18, revealed two important new findings about Down syndrome in a mouse model: 1) there is evidence that synaptic terminals involved in neurotransmission are damaged long before the cells show degeneration; and 2) while cell signaling is damaged, the receptors are not, but are functioning and still trying to find signals. “If we focus only on damage to cell bodies, we underestimate the importance of timing and the potential window for treatment of Down syndrome,” said Mobley, one of the nation’s leading experts in the disorder. He added that this study in mice shows some of the early changes to neurons, which are “really quite dramatic,” and may point the way to novel ways to treat Down syndrome in adult patients. Down syndrome is a chromosomal disorder caused by the presence of all or part of an extra 21st chromosome, resulting in marked deficits in contextual learning and memory. Fifty years ago, the disorder was identified as a chromosome 21 trisomy, meaning that each cell in the body has three copies of chromosome 21 instead of the usual two. Individuals with Down syndrome tend to have a lower than average cognitive ability, and most who survive into middle age begin to show Alzheimer’s-like dementia by age 50 or 60. The incidence of Down syndrome is estimated at one in 733 live births in the U.S., or 5,000 affected infants each year; approximately 95% of these are trisomy 21. Until quite recently, it wasn’t believed that scientists would ever be able to pinpoint the exact gene or genes that cause the disorder. The research team studied a mouse model with three copies of a fragment of mouse chromosome 16, having symptoms very similar to those in humans with Down syndrome. Symptoms included significant cognitive deficits and dysfunction and degeneration of LC neurons (with origination in locus coeruleus). These damaged neurons use norepinephrine, which is a neurotransmitter, to pass impulses to receptors in the cortex and hippocampus – brain regions critical for learning, memory and attention. “We found that, despite advanced LC degeneration, we could reverse contextual learning failure in these mice,” said Mobley. Using a pro-drug for norepinephrine called L-DOPS or xamoterol, the scientists were able to restore neurotransmission in the mice, thus rescuing cognition. While it is yet to be determined if LC plays a role in contextual learning in humans, scientists know that these neurons are affected in other neurodegenerative diseases, including Alzheimer’s disease. In addition, the team identified the gene fragment in mice that is largely responsible for LC degeneration – a region of about 32 genes including APP 23, 24. In a knockout mouse model with the third copy of APP deleted, the decrease in LC neurons did not occur, suggesting that App over-expression is necessary for LC degeneration. However, deleting the extra copy did not restore normal contextual learning behavior. Additional contributors include Paul Aisen and Steven L. Wagner, UC San Diego Department of Neurosciences; and A. Salehi, M. Faizi, D. Colas, J. Valletta, J. Laguna, R. Takimoto-Kimura, A. Kleschevnikov and M. Shamloo, Stanford University. The work was supported by the National Institutes of Health, the Larry L. Hillblom Foundation, the Down Syndrome Research and Treatment Foundation, the Thrasher Research Fund, the Adler Foundation and the Alzheimer’s Association. Please visit http://neurosciences.ucsd.edu/ after 2 p.m. ET November 18 to view an interview with William Mobley and Steve Wagner of the UC San Diego Department of Neurosciences, discussing these findings.